The Hotel Alessi , managed by the Bianchi family since 1999, is a simple and welcoming two-star hotel located in Marina Centro di Rimini. It has free parking, garden, WI-FI and services for children. It accepts small animals and for all guests offers free entrance to the Beach Village water park. The hotel is just a few minutes walk from the beach. 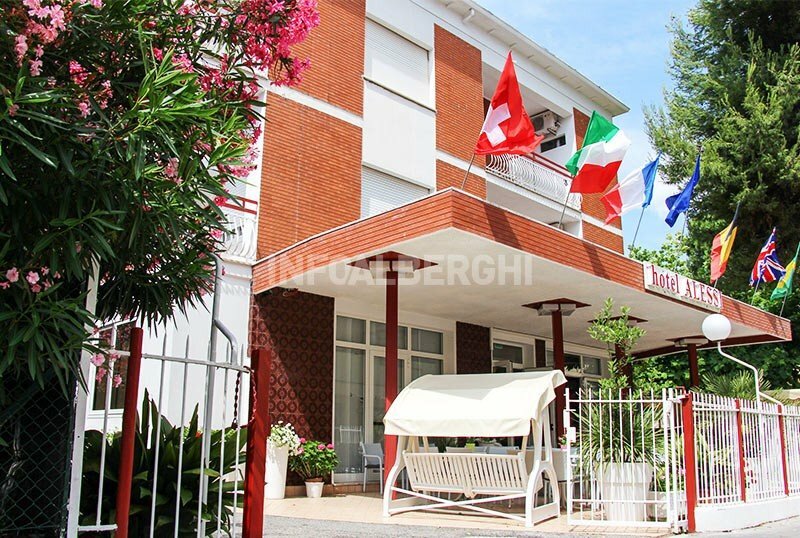 It is located in Marina Centro, a tourist area on the central sea, in a small quiet street, a few steps from the Viale Regina Elena promenade, where there are shops, clubs and bus stops n. 11 which connects the area to the railway station and to the center of Rimini and Riccione. SUN: standard room accessible by elevator and balcony in all rooms. The private bathrooms have a shower and have been recently renovated. The hotel has a small walled garden with a playground area for children, free bicycles, reading room and TV, bar, welcome drink. The hotel offers 2-3 live entertainment evenings a week for the entertainment of young and old. PARKING: private, uncovered and free guaranteed for all; free garage guaranteed for everyone. CONVENTIONS: beach, amusement parks, discos, free entry to the Beach Village water park in Riccione for all guests, organized excursions in the sea and inland, day and evening. PETS: we accept small pets. LUNCH AND DINNER: with main meals you can choose between meat and fish menus, prepared according to the local tradition. VARIATIONS: All guests are greeted with a welcome drink and on Sundays a cocktail is always offered to everyone. The hotel has an agreement with the equipped facilities n. 76-77-78-79-80 offering sports and entertainment activities for adults and children, sports fields, mini-club and playground. For those staying with their dog, a short distance from the hotel is the pet friendly establishment, bathroom 82 Rimini Dog No Problem. List prices are per person for a minimum stay of 3 days. TOURIST TAX: excluded from the price list. € 1.00 per person per day for people over 14 years. Our little guest stays for free! Our small guest from 0-10 years is totally free if staying in the room with 2 adults for at least 7 days of stay in our cheap blue rooms **. Blue Economy Rooms: spartan and simple rooms. They can be reached by stairs (first or second floor), private bathroom with shower (no shower box), window or balcony in the room, not large. From April 20th to April 25th we are open! Come to the Sea! Family Plan = 2 adults + 2 children = 3 shares! Happy Family: 2 Adults and 2 Children, up to 12 years, will pay 3 fees if they are together in the same room for at least 7 days of stay. Advertised price is the average of the periods in which the offer 37.00 € of low season to 55.00 of high season is applied. The price must be calculated from time to time based on the period requested. Are you a group of at least 3 friends friends who want to take a 7-day vacation? Do you have up to 24 years and are satisfied with a cheap accommodation? You adapt and we discount you! The price is indicative and may vary according to the period. Contact us for a personalized quote without obligation. if they stay together for at least 7 days. The price shown is indicative since it varies from period to period, it is an average between the low / high season.